Click here to receive my email newslettersPerfect Bag for the Holidays!! !Elegant and Beautiful Evening Clutch Hand Bag The Evening Bag with Crystal Makes a Great Gift!Unique Frame Evening Clutch BagItem: HB29541-BLK1975Features:Pearl and Crystal Rhinestone accent on the front Extremely sturdy, satin skinFully lined, interior lined with fabric Front Magnetic Clasp closure Shouldersilver tone chain included Color:Clear ~Silver ~ White ~ BlackMeasurements approx: 10" long by 4.5" tall and 2.5" deep. 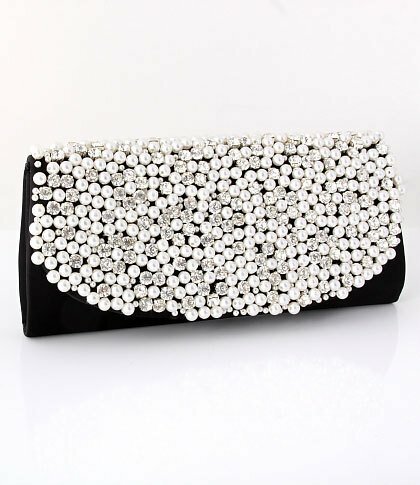 You can't go wrong with this elegant evening bag with crystals. The craftsmanship is topnotch. Each piece is personally inspected.It is new with tag and unused. Please allow 12-15 business days for delivery via USPS. Flaming Hot Deal! Suggested Retail Price: $296.00If you like this evening bag, do not wait, just buy it now!